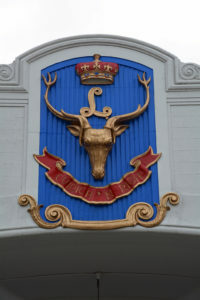 Seaforth Highlanders of Canada crest on the front of the Seaforth Armoury. 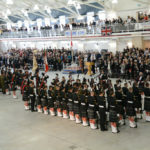 On Saturday September 24, 2016, the Seaforth Highlanders of Canada marched back to the Seaforth Armoury after an absence of four years. 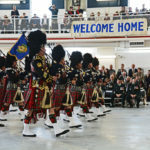 They called it the “Highland Homecoming”. 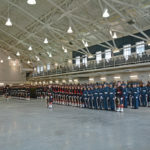 The armoury was renovated and a new building was built in the back lot. 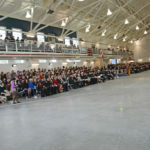 The new building becomes the new Vancouver Garrison and was officially named the Major General Bertram Hoffmeister Building after one of Canada’s best Generals, who had served for many years as a Seaforth. 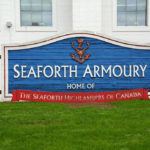 (276) Sign in front of the armoury. 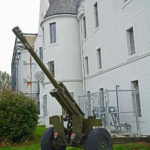 (4) One of the guns of 15 Field Regiment, Royal Canadian Artillery, outside the Seaforth Armoury entrance. 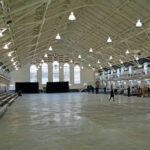 (6) The inside of the Seaforth Armoury shortly before the crowds arrived. 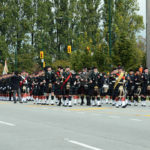 (9) The Seaforth Highlanders of Canada turning off of Cornwall Avenue onto Burrard Street. 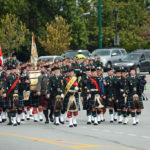 (10) The Seaforth Highlanders of Canada coming off Cornwall onto Burrard Street after marching from Jericho. 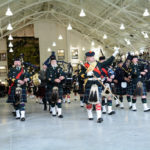 (11) The Seaforth Highlanders of Canada approaching the Seaforth Armoury. 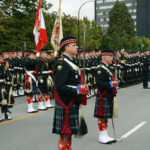 The Commanding Officer is peeling off on the right to take up his position front and centre when he halts the parade. 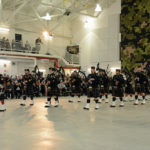 (13) The Seaforth Highlanders of Canada approaching the Seaforth Armoury. 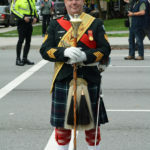 The Commanding Officer is on the viewer’s right to take up his position front and centre when he halts the parade. 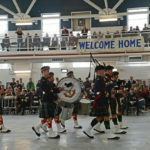 (16) The Regiment passes the Molson Brewery. 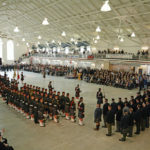 (23) The lead rifle company passes the Reviewing Stand and entrance to the Seaforth Armoury. 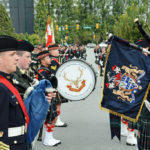 (31) 2893 Port Coquitlam Royal Canadian Army Cadets Pipes and Drums. 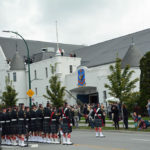 (34) 2016-09-24 Seaforth Highlanders of Canada Highland Homecoming – Troops in front of the Seaforth Armoury. 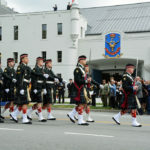 (35) The parade in front of the Seaforth Armoury. 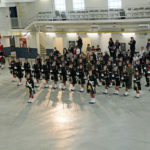 (36) Seaforth Colour Party out in friont of the Seaforth Armoury. 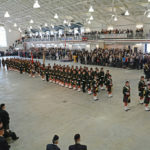 (40) The parade out in front of the Seaforth Armoury awaiting the raising of the Canada Flag. 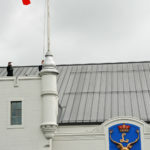 (46) Raising the Canada Flag signifying reoccupation of the Seaforth Armoury. 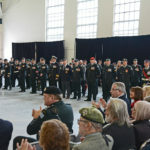 (47) (46) Raising the Canada Flag signifying reoccupation of the Seaforth Armoury. 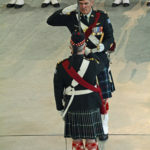 (51) Taking the salute. 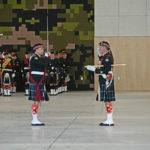 Brigadier R. MacKenzie, OMM, CD and Lieutenant Colonel Dave Fairweather, CD. 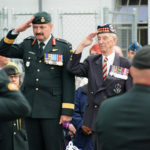 (Retired), WWII Seaforth and twice Commanding Officer. 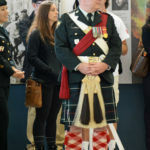 He was my first CO in the Seaforths when I transferred in from the QOCHofC in 1970. 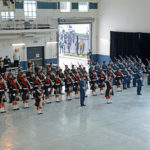 (54) The tail end of the parade, the Cadets and the Deputy Commanding Officer of the Seaforths as the parades moves to enter the Seaforth Armoury on the left. 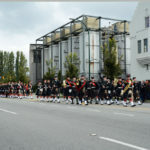 (56) 15th Field Regiment Brass and Reed Band moving to join the parade. 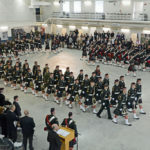 (57) The parade entering the Seaforth Armoury. 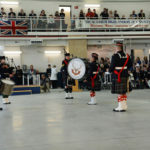 (60) The Seaforth Colour Party entering the Seaforth Armoury. 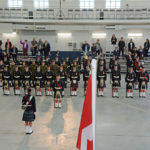 (64) The Seaforth Cadets entering the Seaforth Armoury. (77) Cadet Flag Party marches off parade. 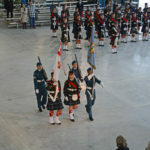 (81) Seaforth and Air Cadets. 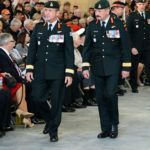 (83) Regimental Sergeant Major (facing camera) and the Commanding Officer. 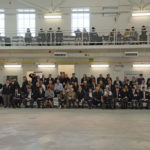 (85) RSM’s Conference on the Parade Square. 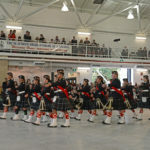 (100) The Cadets march off. 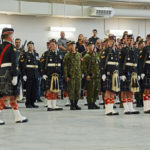 (104) The Seaforth Association members watching as the right markers are positioned prior to the Regiment re-entering the armoury. (115) Right Dress. The Pace Stick is no longer used. (120) Veteran of the Battle of Medak Pocket in the former Yugoslavia. 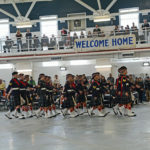 (119) Marching on the DND/CAF Eagle Staff. 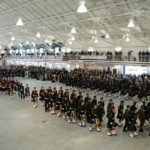 (124) Cadets and Seaforths on parade. (130) RSM on the right. 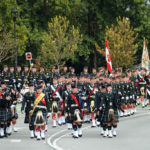 (145) Seaforth Colour Party marching into the parade. 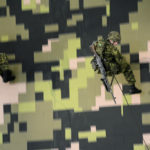 (164) The Minister of National Defence inspects the troops. 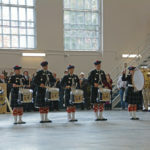 (176) Seaforth Pipes and Drums during a march past. 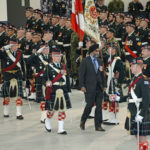 (228) Brigadier General S. Hetherington, OMM, MSC, CD, Commander, 3rd Canadian Division, on the left and Britgadiwer General R. MacKenzie, OMM, CD Chief of Staff – Army Reserve on the right. 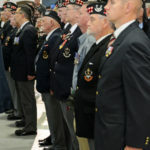 (229) Afgahnistan veterans are acknowledged. 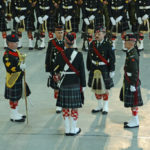 (233) Afghanistan veterans on parade with the regiment and cadets. (254) Minister of National Defence giving a speech. 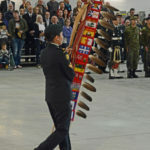 Behind him is the DND/CAF EAGLE STAFF. 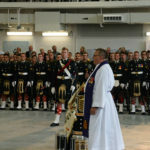 (265) Padre Jim Short leading the Drumhead Service. 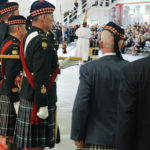 (273) Padre Jim Short leading the Drumhead Service. 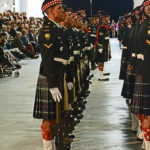 (286) Seaforth Association member on parade – centre rank. 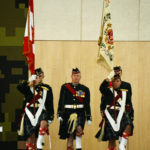 (288) Regimental Sergeant Major on left. 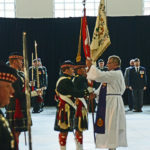 (292) Padre Jim Short returning the Colours to the Colour Party after the Drumhead Ceremony. 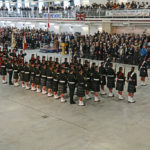 The Seaforths received the new Battle Honour of AFGHANISTAN. 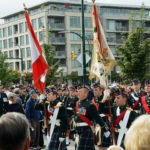 (300) The parade with veterans of Afghanistan at the far end and tgecSeaforth Association members rapt the near end. (312) General Salute for the Minister of National Defence. 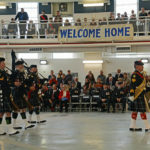 (322) Three cheers for the return to the Seaforth Armoury. (323) An upper gallery. On far right John Mowat, then moving left, Diane McPhee (nee Fairbairn), unknown, then Suzanne Hewlett. 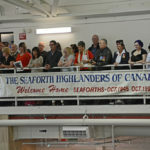 They served in the Seaforths at the same time as I did. 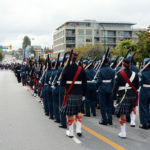 (325) Air Cadets marching with Lee-Enfield No. 4 MK.I* rifles at the slope. 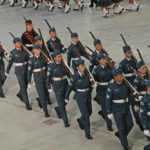 (336) Air Cadets marching with Lee-Enfield No. 4 MK.I* rifles at the slope. 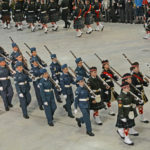 (337) Air Cadets marching with Lee-Enfield No. 4 MK.I* rifles at the slope. (341) Brass section of the 15th Field RCA Brass and Reed Band. 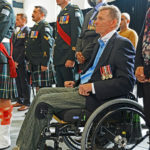 (263) Captain Trevor Greene in wheelchair. 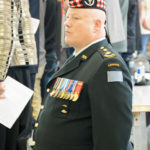 This Seaforth officer was struck on the head by an axe in Afghanistan. 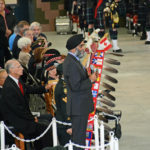 Standing behind him wearing the turban is The Honourable Harjit Singh Sajjab, OMM, MSM, CD, Minister of National Defence. (278) My cousin Annie Soncek who was a Medic covering the event. 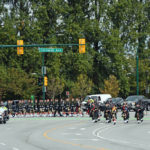 (352) Vancouver Police Pipe Band. 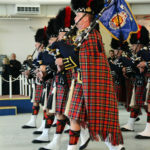 (354) Pipers of the Vancouver Police Pipe Band. 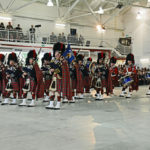 (360) Vancouver Police Pipe Band under the Welcome Home banner. 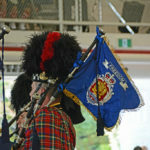 (361) Vancouver Police Pipe Band Pipe Banner. 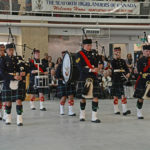 (363) Band of the 15th Field Regiment, Royal Canadian Artilkery. 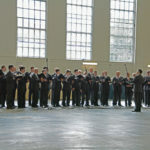 (364) “Chor Leone”, an excellent men’s choir performing. 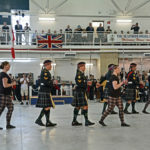 (386) Seaforth Army Cadet Drill Team during their performance. 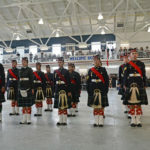 (393) Seaforth Cadet Pipes and Drums. 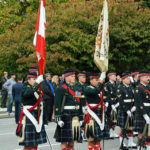 (374) Lieutenant Colonel Paul V Ursich, Commanding Officer of the Seaforth Highlanders of Canada. He is watching the demonstrations. 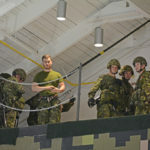 (391) The C6 Gun Race teams getting ready to rappel. (402) Rappell Master preparing to launch the first rap pellets. (411) On rappel. This is the hardest part … going over the edge. (404) Rappellers on the way down with C6 General Purpose Machine Guns sling. The C6 is a 7.62 variant of the FN MAG. (412) The C6 Gun Race teams reach ground level. (417) “A” Company, Seaforth of C, doing the C6 Gun Run. 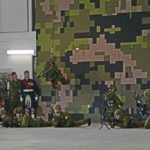 They rappelled down the camouflage patterned wall with two C6 General Purpose machine Gun and tripods, passed through some obstacles, took up firing positions, then retruned to the base of the rappel wall. 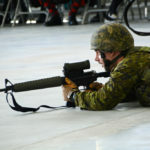 (423) A C6 Race team member with C7A1 rifle. 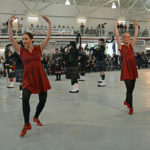 (451) Two dancers of “Shot of Scotch Premier Highland Dancers” They are performing an Irish dance here I believe. Technically speakaing, “Scotch” of course actually refers to the drink (as in whiskey), and “Scottish” to the people. 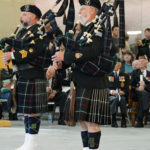 (459) Left is present Seaforth Pipe Major. 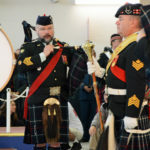 On right is former Pipe Major. 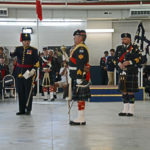 (462) 15 Field Regiment Bandleader, Seaforth Drum Major and Seaforth Pipe Major. (463) Laying down the Claybegs (i.e. small swords) for the misnamed “Broadsword Team” dance. 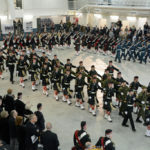 That being said they did a wonderful job and there were a number of Seaforth soliders who performed with the “Shot of Scotch Premier Highland Dancers”. They all did very well. 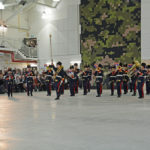 (469) The massed band “Finale”. 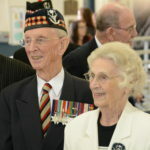 (475) Lieutenant Colonel (retired) Davy Fairweather and his wife. 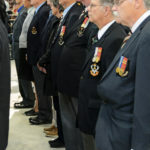 He served with the Seaforths in World War II and was Commanding Officer of the Regiment twice post-war. He was my firsdt CO in the Seaforths. LCol Al Baylis, another CO of mine is behind them looking to the viewer’s right. 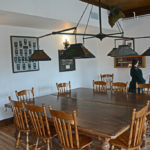 (477) The former office of the Commanding Officer. Many is the time we had a “O” Group in there. (479) Part of the Officers’ Mess. The pool table is gone. 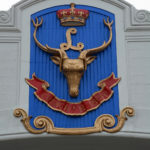 (1) Seaforth Highlanders of Canada crest on the front of the Seaforth Armoury. 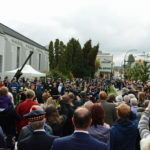 The Regiment and Cadets marched East from Jericho Garrison along 4th Avenue, North on MacDonald, East on Cornwall Ave. and finally, South on Burrard Street to the Seaforth Armoury. 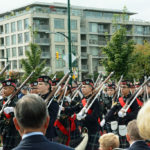 The Regiment marched into place with Brigadier MacKenzie and LCol Davy Fairweather taking the salute, then formed up in front of the Seaforth Armoury. 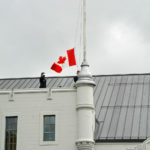 The Canada Flag was raised signifying that the Armoury was occupied again by its regiment and cadets. 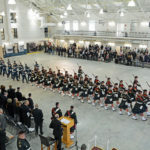 The troops marched into the armoury and were dismissed. 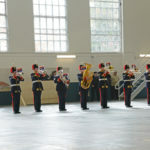 The Regiment and Cadets marched back into the Armoury about 1 pm for the Regimental Review and Drumhead Ceremony. 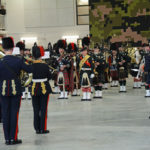 The Battle Honour AFGHANISTAN has been added to the Regimental Colour. 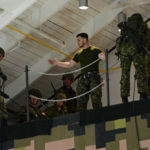 The troops advanced in Review Order and there was a General Salute, then the troops again marched out of the Armoury. 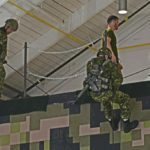 There was a demonstration “C6 Gun Run”, a race between two teams, which started with them rappelling down the high CADPAT camouflage patterned wall. Then the Messes were opened. 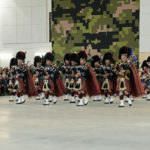 This was a great event and it did the Regiment proud. 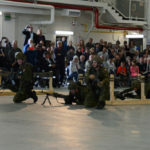 There was an excellent turnout by members, Cadets and Association Members, and the public. There were more Generals there that one usually sees together outside of Ottawa. 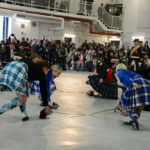 The program was varied and entertaining. Special thanks to the outside groups that helped to make it so special. 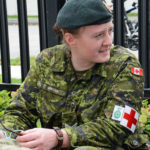 My cousin Annie Soncek was there as an Army Medic so there was excellent medical coverage. Here are a few of the photographs that I took. The weather was perfect for photography. It was dry and overcast, which meant that there were no harsh shadows. 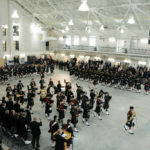 Inside the Seaforth Armoury however it was a challenge. A camera flash is of little use in a case like this and is distracting for others, so I did not use my flash. I bumped my camera’s ISO setting way up and when shooting into backlit areas, such as the large South windows, added exposure compensation. As I expected, parking was a disaster as the new building now occupies what was for over 75 years a wonderful parking and training area. 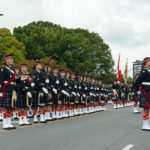 I was very disappointed to see that the Seaforth Association is apparently no longer invited to march with their regiment at these special events. 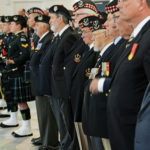 Certainly some of them are too old or in ill-health and they would forgo the honour, but so many of the current veterans are young (20s to 60s) and would be very happy to march to the sound of the pipes and drums with THEIR regiment again. 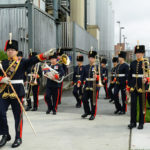 I hope that planners will reinstate this practice of the Association marching with the Regiment and the Cadets. Shown here are low resolution images for the computer. I also have all of them in high resolution suitable for making prints. The number in brackets e.g. (123) before each photo caption is my original photo number which makes reference to a photo easier and shows the sequence that they were taken in. 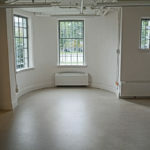 I am working my way through the hundreds of photos, selecting, cropping, tweeking and shrinking the images. Captions also require time to add. Suggestions on identification of people of activities are welcome. Please refer to the photo number when contacting me. 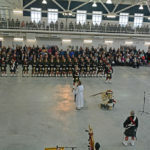 I was able to take photographs of most of the proceedings, so I have lots of pictures that show the Army and the Air Cadets as well as the soldiers. 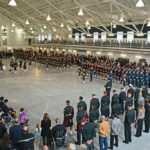 The Regimental Museum, which I started in 1972, and which is now an official Canadian Forces Museum, has not reopened yet in its newest location.